Can I Cook Baby Red Potatoes & Chicken in the Oven Together? 1 Can I Cook Baby Red Potatoes & Chicken in the Oven Together? 2 What Beans Are Red Beans? The word "Tandoor" refers to a cylindrical clay oven used across Asia, so essentially anything cooked in it is termed as "Tandoori." 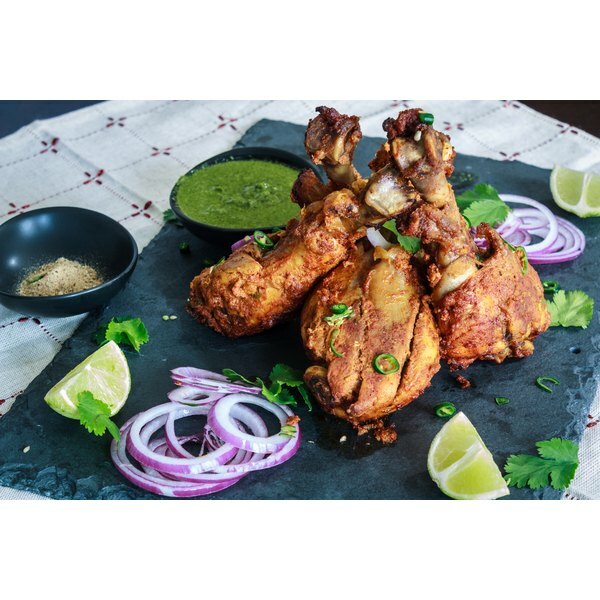 Though I use a regular electric oven here, the recipe will yield the familiar, ever popular, restaurant style "Tandoori Chicken." The recipe can also be grilled and will be great for a flavor-packed barbecue season. Kashmiri Peppers are available in Indian stores. They are milder in flavor but add a wonderful red hue to any recipe. Alternatively use around 1 tablespoon of paprika. It wouldn't need dry roasting. Just whisk into the second marinade. Ginger garlic paste is available in Indian grocery stores. But alternatively, you could use 1 ½ tablespoons each of finely minced garlic and ginger. Clean and wipe dry the chicken pieces. Make deep slashes into the meat, around 2 to 3 slashes per drumstick. Mix in with the ingredients from the first marinade list and keep refrigerated in a covered container for 30 to 45 minutes. Next, dry roast the spices in a heavy bottom pan on medium heat. Stir or shake often to avoid burning the spices. This will take around 4 to 5 minutes. Let the spices cool down a bit, and then grind in a spice mill or coffee grinder to a fine powder. Whisk in the spice mix with the second marinade ingredients in a bowl, to make a thick paste. Coat the chicken pieces with the above tandoori paste, cover and refrigerate for at least 4 hours. I usually marinate the chicken overnight, but not longer. When ready to cook, preheat the oven at 375 Fahrenheit. Using vegetable oil, generously oil a baking tray well and place chicken pieces side by side. Drizzle a little of the vegetable oil over the chicken pieces as well. Roast the chicken for around 50 minutes. Baste and turn the chicken pieces during the roasting process. Adjust cooking time for the size of chicken pieces. Also check with meat thermometer to make sure cooking process is done. For the last 5 minutes of roasting, turn on the broiler on and let the chicken roast for another 5 to 7 minutes. This helps in achieving that tandoori/barbecue effect in the oven. Serve immediately with lime wedges and sliced onions. Is it Normal for Chicken to Bleed When Being Baked? What Is a Good Luncheon Menu?